Apple CEO Tim Cook talks about the new Apple Watch during an Apple event, in San Francisco, California, March 9, 2015. 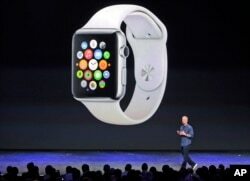 CEO Tim Cook unveiled the much anticipated Apple Watch Monday at Apple's big news event in San Francisco. The Apple Watch includes health, news and sports applications, but also allows calls. Cook said, "You can also, with the built-in speaker and microphone, you can receive calls on your watch! I have been wanting to do this since I was 5 years old." Other products announced at the high-tech news conference included a shiny, skinny and silent MacBook weighing in at just two pounds that the company said is the world's most energy efficient laptop. Apple also unveiled a new deal between Apple TV and HBO, touted growth in iPhone sales and Apple Pay adoption, and announced a set of tools called ResearchKit to help hospitals and research centers develop apps for patients. It cut the price of Apple TV by $30 to $69 and is partnering with HBO to offer its stand-alone streaming service, HBO Go, on Apple devices in time for the "Game of Thrones" premiere April 12. It will cost $14.99 monthly. Apple teased news of the smartwatch in September but has given few details. Scheduled to hit the market in April, industry watchers are eager to see if Apple's version will be the tipping point for the sluggish smartwatch market. There was similar skepticism when Apple released the iPad in 2010, yet the company has successfully sold millions and its popularity has shaken up the PC market. The stakes are high for a company that just dislodged AT&T as one of the 30 stocks comprising the venerable Dow Jones industrial average. Here's a look at what's known about the Apple Watch so far and what to look for. What will the smartwatch do? Show email, texts and phone calls, news, health readings and other notifications. They will be customized for the watch, so you won't simply see what's on the phone. An accelerometer will count steps you take, and an internal motor can signal you with a subtle "tap" on the wrist. There's also a heart monitor; it's not clear yet what heart rate readings you'll get during exercise and rest. NFC wireless technology will to allow you to pay-with-a-tap through Apple Pay at participating retail stores and restaurants. Note: Although some features may work without your smartphone nearby, you will need an iPhone 5 or later model in close proximity for full functionality. What new apps are in the works for the smartwatch? In September, Apple said several apps are in development. One would open your room at Starwood hotels. Another would help you find your BMW in a crowded parking lot. It's not yet known what apps will be rolled out with the April launch. But the success of Apple Watch could ride on what apps are in store to extend the watch's functionality. The watch likely will need to be recharged nightly, just like the phone. Some fitness trackers can last for days without a recharge, but full-featured smartwatches typically last a day or two at most. What's not known is how well Apple Watch will be able to last even a full day under heavy use. How much will it cost? When will it be available for purchase? Apple has said the watch will start at $349 for the base model. There will be three different lines: aluminum for fitness enthusiasts, stainless steel for everyday wear and luxury 18-karat gold. Each line will come in two sizes and offer a variety of wristbands. The luxury edition might cost several thousand dollars, in line with other high-end jewelry. One question is whether Apple will let you keep the expensive casing and swap internal components as they are upgraded. Apple will likely give a specific release date on Monday, along with a list of initial markets outside the U.S.
One thing that sets Apple Watch apart is the control you'll get by turning the dial, known as the digital crown. Many rival smartwatches have buttons that do little more than turn on the screen and make menu selections. With Apple Watch, you'll be able to turn the crown to zoom in and out. You can get a closer view of a map that way, for instance. You'll probably still need to touch the screen to slide the map around. On the low end, Piper Jaffray's Gene Munster estimates 8 million Apple Watches sold in the first nine months they are available. Forrester Research has predicted 10 million and Strategy Analytics is calling for 15 million. By comparison, only 5 million smartwatches, from all makers, were sold last year, according to Strategy Analytics. Apple sold about 5 million iPhones and almost 15 million iPads in their first nine months on the market. What else, other than the watch? There might be an update on Apple's plans to replace iPhoto with a photo app similar to what's found on iPhones and iPads. A new Apple TV streaming device? It's been years since the last hardware update, though there's speculation an announcement would instead involve Apple's role in a stand-alone subscription service from HBO. Apple got a streaming music service when it bought Beats last year. When will Apple integrate that into iTunes? Might announce additional features or car models with Apple's CarPlay, which lets drivers control iPhones with voice commands, a touch on the steering wheel or a swipe on a dashboard display. A larger-size iPad in the works?